Synopsis: It's a dangerous world, with no laws. Few people. Herds of the Infected. Among them: one missing child and one man who'll do anything to rescue her. Would you face monsters for the ones you love? There are no people left on Earth, except Eli Stentz and seventy-five others. They hide within the steel walls of a settlement called Hope, tormented by a horde of soulless, mutated humans who howl at their doorstep day and night. The survivors call them zombies, but the name doesn't quite fit. The world belongs to them now -- the Parasites. One day, a stranger emerges from this void with tales of survival and horror. Eli can't believe his eyes -- this man shouldn't be alive. Six years ago, humanity succumbed to a mysterious epidemic and civilization collapsed. Society never recovered, leaving the post-apocalyptic landscape a barren, dangerous wilderness. So why would this stranger kidnap one of Hope's children? And why Lily, a girl Eli loves like a daughter? Plagued by these questions, he has no choice but to face the monsters outside Hope's walls to rescue her and bring her home. But he doesn't expect the mystery lurking in the wilderness. For the world isn't empty after all -- there are more settlements. Most have abandoned American democracy, embracing a more dystopian way of life. And they are connected by a disturbing conspiracy. But Eli has other monsters to fight. For outside Hope's walls are the memories of his violent past. After all, no one lives through the apocalypse without getting blood on their hands. Eli knows that better than anyone. Part psychological thriller, part soft horror, with a touch of near-future science fiction and the supernatural, "The Human Wilderness" is the perfect novel for fans of "The Walking Dead." For an introduction into the world of "The Human Wilderness" and The New America Trilogy, check out the prequel novelette, "Among the Monsters." 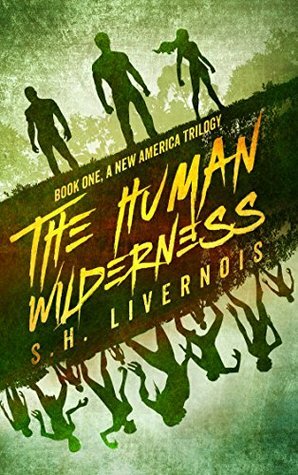 Review: A good zombie novel, The Human Wilderness makes one wonder just what they would be like if suddenly dropped into an apocalypse, forced to survive. Can you escape your past? When society crumbles, and you've banded together, can you ever again truly trust outsiders? How much blood are you willing to spill to protect yourself and your loved ones? Like Eli, will you be haunted by the things you do to survive? About the Author: S.H. Livernois lives in Northern New York, just south of the Canadian border in a very small town. She is an aspiring fiction author and long-time news writer. Her first book of short stories was just published and she's working on two horror novellas and a post-apocalyptic trilogy. In 2005, she began her writing career as a local reporter for a small newspaper. This lasted until 2010, when she left the writing world in a brief bout of insanity, working as a secretary for the county government for three years. In 2013, she finally came to her senses and quit her job to be a writer again. These days she's still using her journalism skills, writing news online at Inquisitr. What else? She has a big garden, loves to read and travel, take pictures, make quilts by hand, color, go for walks, pet her dog Maggie, gossip with her mom and sister. She has a twisted sense of humor, swears too much, a very bad memory, tends to exaggerate when she tells stories, and likes to spend time alone. She supports people having kids but doesn't intend to have any herself, believes in ghosts, thinks dark thoughts, and watches too much TV.